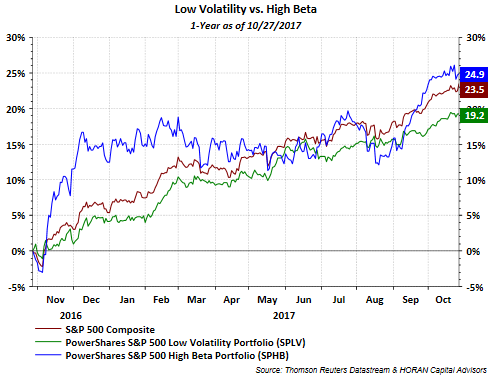 I have read commentary over the last few days noting the outperformance of the PowerShares High Beta Index (SPHB) versus its counterpart, the PowerShares Low Volatility Index (SPLV) over the past 1-year time frame. However, much of this outperformance was generated in the couple of months following the November election. Much is going right as it relates to the equity markets around the globe; however, this past week saw the market punish companies that reported earnings that did not match market expectations. 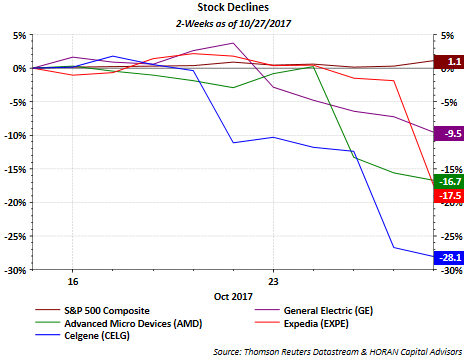 The below 2-week chart only lists a few of those companies, but companies like Celgene (CELG) down 28.1% and Expedia (EXPE) down 17.5% suffered much of their losses on one or just a few trading days. 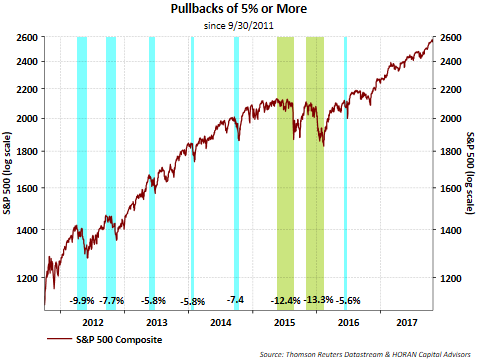 Admittedly, in an equity market run investors are currently experiencing, i.e., the second longest run without a 20% pullback, a common theme that continues to seep into ones thinking, including mine, is when is the market going to experience a bear market correction of 20% or more. Even a double digit pullback is a scarcity as the below chart of the S&P 500 Index shows. The last double digit pullback occurred in February of 2016. 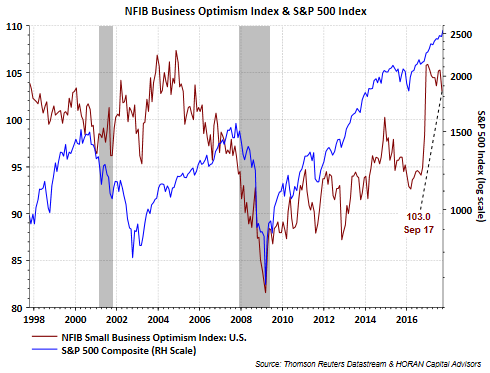 One set of indices that seems to cycle from positive to negative over a relatively short period of time are the Citigroup Economic Surprise Indices (CESI). 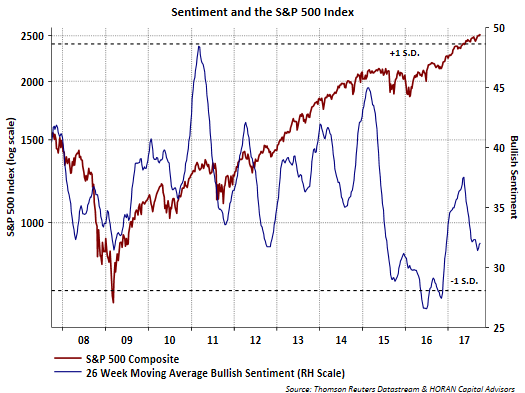 This aspect of these indices means they gain prominence from a commentary standpoint when they reach high and low points. 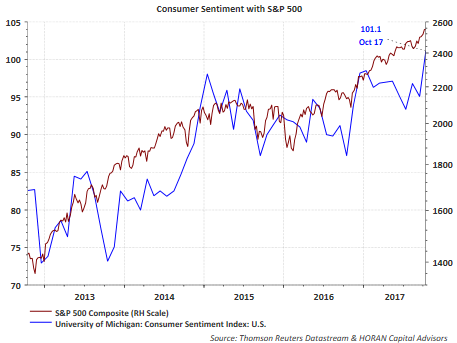 What is important for investors to know is the CESI is a mean reverting index, that by design, cycles between highs and lows over relatively short periods of time. 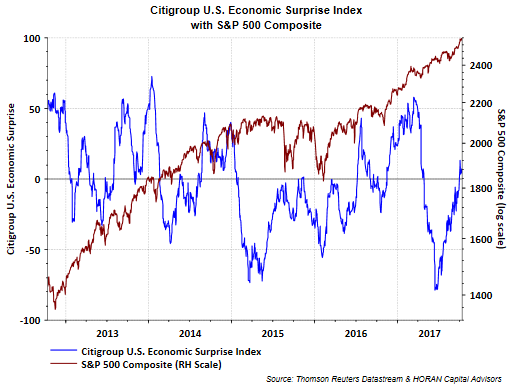 In June of this year, the Citigroup U.S. Economic Surprise Index (CESI-US) was a minus 78 after falling from plus 57 in March. 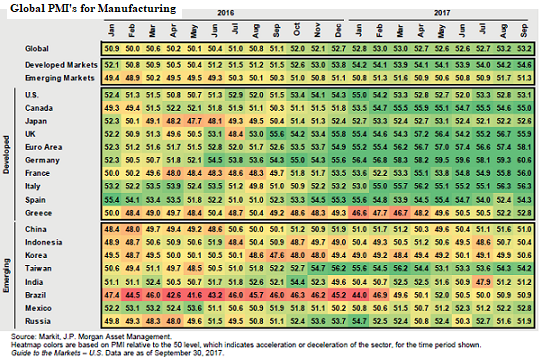 At the June low some commentary began noting the U.S. economy might be headed for a recession. However, the correlation of the S&P 500 Index to the CESI-US is a small negative .04, so actually a slight negative correlation between the two variables. Our Fall 2017 Investor Letter has a music lyrics theme to it and since we have an age-diverse team as it relates to the employees of HORAN Capital Advisors so goes the taste in music for our colleagues as readers of the newsletter will find out. As Chuck Prince, former chairman and CEO of Citigroup, said almost a decade ago, "As long as the music is playing, you got to dance." This seems to be one of those markets where the music just doesn't seem to stop and just maybe has resulted in one of the most hated equity market rallies in some time. The Fall 2017 Investor Letter touches on a number of topics, including the unwinding of the Fed's balance sheet, low interest rates and the negative impact on income generation for investors and the benefit achieved by investors that have pursued diversification outside of the U.S. equity market.